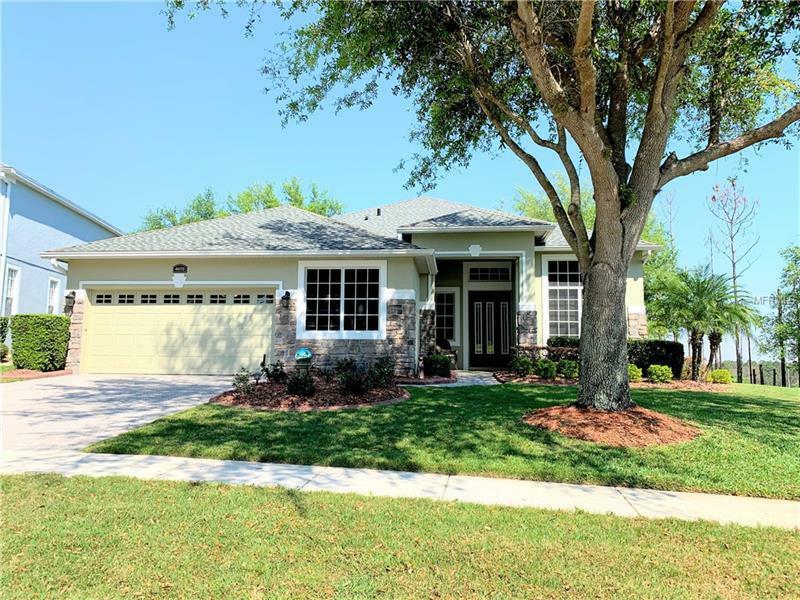 Located in the Guard Gated community of The Legends this beautiful home is a 3 bedroom 2 bath with a den, and an over-sized 2 car garage with plenty of storage room. The kitchen/family room combo is perfect for family gatherings and the gourmet kitchen features new appliances, an in wall oven/microwave , french door refrigerator, decorative glass insert cabinets, and granite counter tops. There is also an eat-in nook and a breakfast bar. But just open your sliding glass doors and expand your living area to the enclosed lanai, which features glass windows, a sliding door, and overlooks the inviting in ground gunite, heated spa and screened patio area. It's the perfect place for a nice barbecue, or relax with a glass of wine, enjoy the waterfall feature and watch the Disney fireworks. The master bedroom features cherry wood flooring and has plantation shutters on the windows and your private sliding glass door to the lanai area. The spa-like master bath features a separate Jacuzzi tub and shower and dual vanities. The additional bedrooms also feature cherry wood flooring and they are nicely sized. This home also features a den area perfect for a home office or studio. On top of all these beautiful features, the home is being sold fully furnished(just bring your clothes and move right in) has a new roof, a/c, hot water heater and was recently painted outside and in. Sellers including pool service, pest control, and lawn care until March 1, 2020. This one will not last long so schedule your showing today! Pet Restrictions: Any and all restrictions should be verified by the buyer with the HOA.